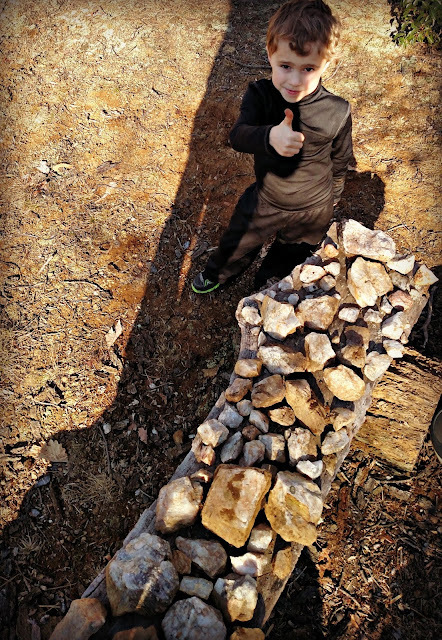 Cort set up a rock shop on top of our mountain. He was very busy for hours digging up rocks and carrying them over to his 'shop'. They run $1.25 each if anyone is interested, but wear your hiking shoes and bring some bottled water because his shop is a mile long steep trek off the beaten track. You might be paying more for the experience than the rock. He can come get some of our rocks and you can lug them to the rock store for him, our rocks are different and will be a big seller! Maybe he could start bringing some of the big one's home and build stuff with them? My house was owned by an avid hiker 30 years ago and he brought back huge rocks from each of his hikes. I have beautiful paths and walls made from his hikes. I love that. What an enterprising young man, and I would definitely buy one of those rocks, plus walk up that track if I lived nearer to where you live. Unfortunately there is a huge ocean between us! LOL! He is truly ambitious! If I lived close to there I'd get a few just because I feel bad that he went to all that work, and won't get buyers. Cort is very hardworking and focused on his work. I do need some rocks for my garden! Nice looking rocks! I had a rock collection as a kid but they were small pieces. Cort always comes up with great ideas! Its a wonderful idea. To add a suggestion to his rock shop, hw might even be able to sell,,white rocks, red rocks, green, black and brown rocks. We did it once. Very industrious guy! I hope he gets a sale. I so love being outdoors with kids. We were grandsitting, all last week, and I AM SO TIRED!!!! It rained most of the week, too. We did have much fun, though! I love it. If I were in the vicinity of your mountain, I'd be a customer of his rock shop!!! !